The compact Rapid Monta is designed for high mowing acreage performance on hillsides. 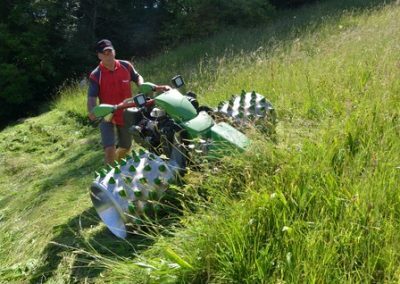 A low machine centre of gravity makes the Monta particularly suitable for mowing steep hillsides and benefits from a wide axle width and positioned to give a higher weight transfer to the attachment, excellent for keeping a cutterbar close to the ground. The Monta comes with a choice of either 14hp or 16hp petrol engines, constantly variable hydrostatic transmission, switchable steering either by lever or handlebar to a zero turn axle. The PTO is independent and engaged proportionately by switch. 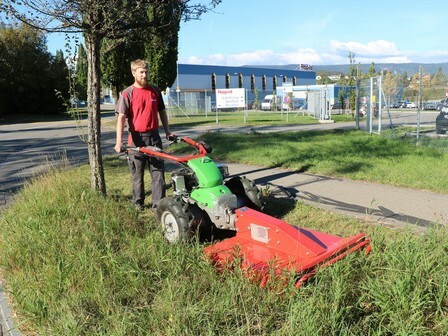 The handlebars can be offset or fully rotated (Monta S) for two direction working. The Rapid Monta is available in two versions, model M or S. The Monta M retains mechanical operation of all controls whilst the Monta S model benefits from all new electronic control giving a smooth easy to operate feel to the machine. The safe working limit is 120%.